The pocket trumpet comes in smallest size also knows as mini trumpet. Some people take these trumpets as toys but in reality, it comes with all top line feature and sound producing ability. Smart in size and so easy to carry and have more gripping in handling. Usually beginners like Pocket trumpet due to simplicity and convivence in playing. If you see the shape of Pocket trumpet then you will realize that all component same like other professional trumpet rather than lead pipes. In this trumpet lead pipes are less lengthy to make it more mini or smart in size. Other hand the main bell comes in standard diameter, Soft piston system with three pressing valves, Tube sliding and mouthpiece main part of pocket trumpet. The pocket Trumpet produce loud/rich sound, level intonation and projection. Usually main body made with brass and nickel coat maintaining gold extras finish. Comes with 3C standard mouth piece for proper air resistant. 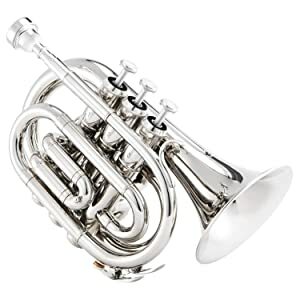 In short, if you want and required a small size trumpet for better practice so here, we selected some model that professional in functionality and ability to satisfy end users. Moreover, pocket trumpets are outstanding tool for fun, exercise, and proficient career, especially for a regular professional player. ​This pocket trumpet comes in different multiple color collection so you can choose as per choice. The Mendini MPT-N is nickel plated Bb Pocket Trumpet that comes with 7C mouth piece. The total main body made with Phosphorus copper specially used on Lead mouth pipe. In this company provides 0.46 inch bore and 3.75-inch bell DIA for better sound production. Easy to handle and beginner user friendly even in long run performance. In this model company provides comfortable white faux mother of pearl inlaid buttons for easy pressing valves while playing. This model comes with Oil bottle for piston valve, Protection or travelling case, Cecilio 92-D chromatic tuner, Polish cloth and pair of gloves. Comes in many attractive colors. Smooth and soft playing with 7C mouth piece. 0.46 Inch ideal bore and 3.75 Inch Bell DIA. 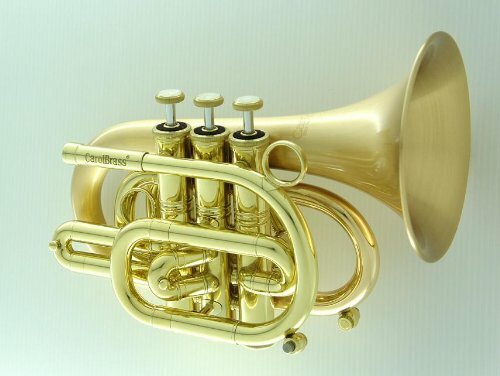 If you want loud and unique sound with smart size trumpet then ideal model for you. It comes in Coral brass high quality construction that fall in CPT series. This Pocket trumpet comes in compact size and .460 bore as well as Key of Bb. The Bell diameter comes in large size around 4.724 inch that coated with brushed gold. It contains three inlaid valve pressing button that made with stainless steel and close tolerance while playing. This model also easy to handle with customized first and third Thumb ring hook for proper adjustment. In this model company provides 2 water keys and weighted bottom caps. This model has easy projection and intonation control with upper soft pressing button. High quality brass made Pocket Trumpet. Large Bell DIA so you get Loud and rich sound. Easy to play with smooth projection and intonation. Ideal Bore for frequent Air resistance blow. Upper Gold color coating to make more attractive. That is best value pocket trumpet if compare the quality and feature accuracy. The key of Bb and provides amazing intonation or projection due to comes in ideal size 11.6mm/0.457inch bore and 101mm/3.98inch bell. The valve button comes in white faux mother of pearl inlaid pattern. The outer body made with Beautiful/uniform silver lacquer, dazzling and shiny with durable quality. That is attractive and transparent color with superb reflection. For better performance with long time result All internal pipes must clean by ultrasonic waves for 3 times. More over must oiled for maintenance, smoothness and easy projection while performance. Comes with all important accessory included White Gloves, Cloth, Valve Oil, Trumpet Cleaning Suit, 7 C Mouthpiece and Hard Case. Made with high quality brass with lacquer coating. Modern valve with faux mother of pearl inlaid button. Proper output and sound with soft projection. Looking shinny attractive and transparent reflection. 11.6mm/0.457inch bore and 101mm/3.98inch bell.